Please see the topic Getting Started with Photo Editing for details about loading an image into TwistedBrush Pro Studio. 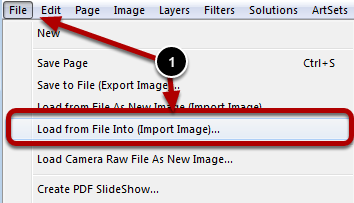 In addition to the Load from File As New option where the current page is cleared before the image is loaded there is also an option to load the image file into the currently selected layer. The loaded image will not be resized nor will the page size be changed to accommodate the file so white space or cropping may occur.